Despite regional tension, Jordan is seeking to revive co-operation with Israel on a project to boost the receding water level of the Dead Sea, the lowest point on earth, officials and an Israeli diplomat said Monday. The surface level of the saltiest water in the world has been receding 1 meter (3.3 feet) every year for at least the past 20 years, said Zafer Alem, secretary-general of the Jordan Valley Authority. If it continues, he said, the Dead Sea and its ecosystem will be gone in 50 years. “Until the end of the sixties the level of the Dead Sea was 392 meter below sea level, now it is 411 meter below sea level” says Elias Salameh (Professor Hydrology of the University of Jordan). With this the surface is also a third smaller and the coastline kilometers shorter. 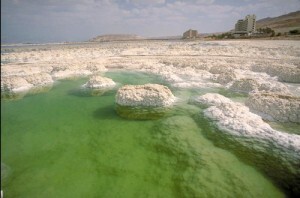 If this goes on the Dead Sea will be gone in fifty years. This happens because hardly any water enters the sea: virtually all the fresh water (of the river Jordan etc) is being used for irrigation and drinking water. Moreover a lot of salty water from the sea is used for the production of salt and minerals in factories on both sides of the lake. The lowering of the Dead Sea can have serious consequenses for the region, freshwater wells disappear too, and even earthquakes can be the result of the changes in the geology. A possibility is to bring in water by digging a canal from the Mediterranean or from the Red Sea. During the Earth Conference in Johannesburg in 2002 Israel and Jordan choose the second option. The canal from the Red Sea to the Dead Sea will be in fact a pipeline, in which also energy can be produced to make fresh water from sea water. This is badly needed for the growing populatiion of the region. The project will cost some five billion dollars. The countries hope that the international community wil be ready to help paying this, thinking of the huge historical, cultural and economical importance of the Dead Sea. Jordan appealed on Tuesday (June 01) for international assistance to help save the ecosystem of the Dead Sea, whose water level is dropping. The surface level of the sea — the saltiest water in the world and the lowest point on Earth — has fallen 1 meter (3.3 feet) a year for at least the past 20 years because of evaporation and the diversion of rivers by Syria and Israel. Experts warn that the Dead Sea will disappear in 50 years if current trends persist. One solution would be for Jordan and Israel to draw water from the Red Sea, which lies at the end of the long valley in which the Dead Sea lies. The two countries have agreed on the plan, but they are waiting for funding approval from the World Bank and other donor countries. “We appeal to water experts attending this conference to help us explain the crisis of the Dead Sea at international forums,” Jordanian Water and Irrigation Minister Hazem al-Nasser said. He was speaking on the sidelines of a five-day meeting on water held at the Dead Sea resort of Southern Shuneh, 45 kilometers (30 miles) southwest of the capital, Amman. The conference brought together some 1,500 experts and officials from 30 countries to discuss the management of water. “The Dead Sea is a unique international treasure, and it’s the world’s responsibility to take decisive action immediately to save this treasure,” al-Nasser said. He said the receding of the sea will have negative consequences, such as the formation of sink holes, 20 meters (66 feet) in depth. US$1 billion, would exploit the 400-meter (1,320-foot) difference in altitude between the Red Sea and the Dead Sea. The Friends of the Earth Middel East are working on the problems around te Dead Sea. Jordan, Israel and the Palestinians agreed to go ahead with a three-year feasibility study to save the Dead Sea, whose constant evaporation will lead to its complete disappearance in five decades, experts say. Meeting on the sidelines of the World Economic Forum on the Jordanian shore of the Dead Sea, officials said the US$15 million (€12 million) feasibility study would start this year and is expected to finish in 2008. “Our goal is to help stop the decline of the Dead Sea. Jordan, Israel and the Palestinian Authority will enjoy the fresh water and the area will become fertile,” Israeli Cabinet Minister Benjamin Ben Eliezer said. Jordan appealed last year for international assistance to help save the sea and its fragile ecosystem. The surface level of the sea — the saltiest water in the world at the lowest point on earth — has fallen 1 meter (3.3 feet) a year for at least the past 20 years because of evaporation and allegedly the diversion of rivers by Syria and Israel. Geological experts warned that the drop in the water level would increase the earthquake possibilities. They also warned that the Dead Sea will disappear in 50 years if current trends persist. The World Bank will invite donors to a July conference to raise funds for the feasibility study, said Zafer Alem, secretary-general of the Jordan Valley Authority, a state-run Jordanian agency in charge of developing the area surrounding the Dead Sea. The location of the conference has not yet been announced. The study will focus on the impact of water conveyance from the Red Sea, which lies at the end of the long valley in which the Dead Sea lies. Ben Eliezer said the three parties want to ensure that the Dead Sea will not be harmed by the Red Sea project, which is still being negotiated. “The project involves three parties and our hope is that an era of peace is coming to our region,” the Israeli minister said at the opening of a panel to discuss the survival of the sea. The Dead Sea is shared by Jordan, Israel and the West Bank. The Red-Dead Sea canal project, which is expected to cost more than US$1 billion (€797 million), would exploit the 400-meter (1,320-foot) difference in altitude between both areas. If implemented, the 300-kilometer (248-mile) desert area between the two seas would benefit from the fresh water to turn the region into an agricultural hub for the benefit of the three countries. A desalination project is also envisaged to provide drinking water for the Jordanian capital, Amman. Israel and the Palestinian territories will also benefit from the drinking water. GNF together with its local partner EcoPeace / Friends of the Earth Middle East (FoEME) throughout the year 2006 will focus attention on the dramatic decline of the Dead Sea, the demise of its ecology, the loss of its tourist potential and the need to reverse the situation. The high waterconsumption of Israël causes a lower water content of the river Jordan, and this makes the Dead Sea dry up. The production of salt needs a lot of energy and damages the natural ecdosystem of the place. Israeli and Jordanian government officials signed a agreement to exchange water and jointly funnel Red Sea brine to the shrinking Dead Sea. on December 9, 2013, in Washington. According to Thursday’s agreement, Jordan and Israel will share the potable water produced by a future desalination plant in Aqaba, while a pipeline will supply saltwater to the Dead Sea. The project involves the construction of a 65- to 80-million cubic meter capacity desalination plant in Aqaba, from which Israel will buy some 35 m.cu.m. of water annually for its South, Jordan will buy an additional 50 m.. In addition, the agreement entails the construction of a 200-kilometer pipeline to carry brine from Aqaba plant to the shrinking Dead Sea. Not only does the agreement have the potential to save the Dead Sea and “solve the water shortage in two countries, it can “build the peace process between the two countries. The project will serve as a pilot for a potentially expanded version of the program, with greater desalination output and more brine flowing to the Dead Sea, or possible additions such as hydroelectric power plants. Environmentalists praised the signing the agreement as a step forward in regional cooperation, but expressed several reservations regarding certain elements of the plan. For years, EcoPeace: Friends of the Earth Middle East has objected to the idea of conveying brine from the Red Sea to the Dead Sea. EcoPeace, a regional organization that brings together Jordanian, Palestinian and Israeli environmentalists, has long theorized that the mixing of brine with Dead Sea water could alter its unique chemistry. In addition, the high cost of the pipeline could lead to higher priced water . Another environmental issue that EcoPeace is concerned with is the proposal of Mekorot and the Water Authority to convey the soon-to-be 100 m.cu.m. of Lake Kinneret water to Jordan through a new pipeline. Instead, the organization wants Israel to convey the water to Jordan by releasing it down the Jordan River, which is desperately in need of increased flow. “There is a strong movement locally around the lower Jordan that this is an opportunity not to be missed,” Gidon Bromberg, Israeli director for EcoPeace, told. “The Water Authority and Mekorot are more interested in moving water in pipes than thinking of the benefit for the region.” “It doesn’t matter whether the water will come by trucks or pipes or by the river,” Yael Shavit, a spokeswoman for the local people said. “We want it through the river, because we want it alive.” By releasing the increased quantities of water into the Jordan River, which is already under rehabilitation from decades of contamination, Bromberg argued that both residents on both sides could once again enjoy a fast-flowing, clean river. Jordan requires this water to be transferred in the country’s north rather than downstream, as the area is in dire need of freshwater,. In particular, the influx of Syrian refugees has placed a huge amount of pressure on the country’s natural resources, he added. The project is key to both improving natural resource needs as well as furthering political compromises in the future. When there is regional project between the two nations, it is a step forward in improving the relations. • Why is the Dead Sea so salty? • The Dead Sea is far below sea level. (The lowest place on earth!) Find out why this place is so extremely low. • What will the ecosystem look like when the Sea is completely dried up? 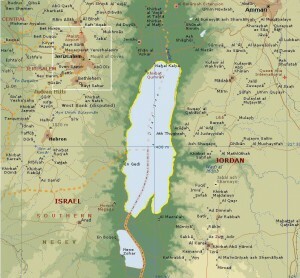 • Which interest do Jordan and Israel have in keeping the Dead Sea filled with water? • The Dead Sea is not completely dead. There are microbes (bacteria) living in the salty water. Organismms living in such extreme places are called ‘extermopiles’ find information about these extremopiles In which places on earth could you look for more extremophiles? • If Israël and Jordan are bringing in seawater from the Red Sea to the Dead Sea in the future, will the ecosystem of the lake change? Explain why or why not. 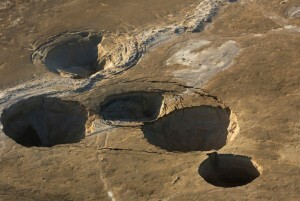 • The drying up of the Dead Sea can be seen as a ‘negative sustainable footprint of the modern israel. How can people turn this into a positive sustainable footprint? Collect information from newspapers, internet etc about the role of water shortage in the actual problems in de Middel East. Working in small groups find information, discuss, think about, do research etc about the problem of saving water in dry areas and in places where the human population is growing fast. This can be made very interesting by doing is together with students in other parts of the world.